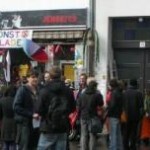 Gentrification in Berlin continues: after the eviction of Brunnenstr. 183, a house project that was hosting a Free Shop, all inner city areas are becoming posh. This is more visible in Kreuzberg than anywhere – a quarter that was during the time of the divided city an island of alternative live-style, the area is now becoming interesting for investors such as Starbucks and McDonald’s. A nice cafe on Heinrichplatz, just by Oranienstr., had to leave as the rent was doubled. Now the space has been squatted and another Free Shop been established there. Athens (Greece): Welcome in a new squat! Athens seems to be going through exceptionally tough times: austerity measures that make society kneel under great pressure are put to practice, police units are stationed in every single block downtown, the big unions (GSEE, ADEDY) are completely silent, while demonstrations are weak, with little participation and even less passion. And yet, although society seems to be numb and not to know how to react against the intensifying pressure from all sides (needless to mention that the mass media have been very creative in the way they combine terrorism with the anarchist/antiauthoritarian movement every single day on the news), a new squat is born in the neighborhood of Marousi (northern suburb of Athens). “While many young people have no interest in what is going on in society, and spend their time in clubs and internet cafes, our need and desire to articulate political discourse through various actions and to resist the repression, breach and limitation of our rights, in a society which has enrichment and individualism as its sole values, all the above urged us to create a free space where we will have the opportunity to self-organize”. An offensive walk against evictions, but not only… Newspaper office, schools, police cars and white walls are covered with slogans. A meeting was given on Wilson square, calling to bring gardening tools, but no more details were known. From here, people walked to the occupation place: abandoned land on the side of a main road and some empty houses. City-dweller with their spades, budding gardeners or local truckers in struggle joigned that action. Ten years ago, a couple of truckers have been evicted from these parcels due to town-planning pressure. Now they are occupied. In several hours, the area has been cleared of brushwood, and ready to be planted. People pass by, but there’s nobody. At the windows, cameras substituted underwears. It’s impossible to chat in the streets. One gets drunk to forget the bosse’s scurvy tie and the terror of the organiszed reality. And then, on Saturday night, one even goes out to the club. Some people disappear, no one hears about them anymore. Let’s organize ourselves against the grey sky! „One“ opened this big empty flat since years: you could have done it! „One“ occupies this place since December, „one“ doesn‘t own it. The door will stay opened each Tuesday and Friday, between 4 and 8pm, to read or drink a coffee. But don‘t come if you denounce your colleague to get ahead or if you applaud when a sans-papiers is arrested by the RATP security [metro pigs] !